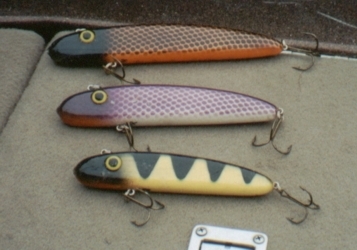 Here is a link to Terry Rockteschel's line up of custom, hand made baits. These baits have been responsible for putting many nice fish in my boat as well as anyone else I know of who has any. They are very easy to use. The seven inch Twitcher in gold with a white belly and yellow eye(Walleye pattern)is my personal favorite. His Twitchers are available in 6", 7" & 10". He also has a similar, but deeper bodied, bait he calls Louie which are available in Little, Junior & Standard sizes. Note, he also has a line up of the absolute best top water baits you can get your hands on. He is a perfectionist and his baits reflect every bit of it. The only way to get your hands on any is directly from TR. This page may not last very long if he gets to busy and asks me to remove it. He loves to fish as much as I do and last I heard he was 97 baits behind! P.S. Don't forget to ask him about any new baits or colors he has been working on! You should see them with holoform, he took second in Paul's Pro-Am with one!